We don’t usually think of fish as being particularly smart, but a new experiment reveals that at least one species of tropical fish is capable of distinguishing between human faces. Scientists have never seen fish do this before, and it’s changing our understanding of these creatures and how brains work. A new study published in Scientific Reports shows that archerfish are capable of learning and recognizing human faces with a high degree of accuracy. This feat reveals that this complex task doesn’t necessarily require a complex brain with a sophisticated neocortex, a highly evolved part of the brain responsible for sight and hearing in mammals. Fish, it would now appear, are more intelligent and more “aware” of their environment than we assumed. The idea that fish don’t feel pain, for example, is gradually falling out of favor (pdf). And recently, it was discovered that manta rays, which are a type of fish, are capable of passing the mirror test, which is considered an important measure of self-awareness. Now, it may not sound like much, but the ability to distinguish human faces is more complicated than it sounds. Most faces tend to share some basic features, such as a pair of eyes, a nose, and mouth, and in predictable orientations. In order for us to tell people apart, therefore, we need to look for distinguishing features. To test this idea, Newport and her team sought to determine if another animal with a smaller and simpler brain—and with no evolutionary need to recognize human faces—could still accomplish this task. Their resulting study shows that fish, despite lacking the sophisticated visual cortex of primates, are capable of distinguishing one face from a sample of 44 new faces. In a word, that’s incredible. The researchers used archerfish in their experiment, a tropical fish that spits jets of water to knock down aerial prey. The archerfish were shown either a previously learned face or a series of new faces. Using food rewards, the archerfish were trained to choose between the two faces, which they did by shooting jets of water at the familiar face. 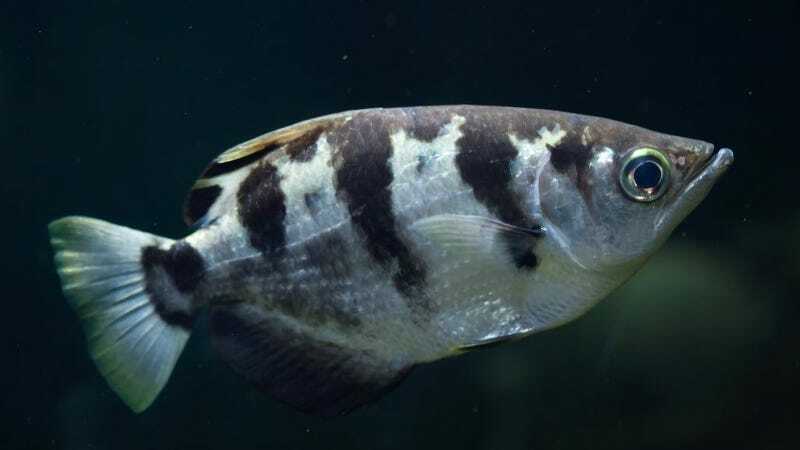 To the surprise of the researchers, the archerfish consistently picked the familiar face (which set them up for a reward) even when more obvious features, such as head shape and color, were removed from the images. The fish correctly recognized 81 percent of faces out of a possible sample pool of 44 faces. This rose to 86 percent when facial features, such as brightness and color, were standardized. Indeed, this experiment shows that fish, or at least archerfish (who likely evolved their powerful visual abilities to help them hunt), are capable of making very fine visual distinctions in their environment. Fish did not evolve the ability to recognize human faces, but it now appears that their visual skills can be leveraged for this very purpose. What’s more, this study demonstrates that complicated brains and a neocortex aren’t necessarily required for facial recognition tasks. As a final note, human facial recognition has been previously demonstrated in birds. But unlike fish, they possess neocortex-like structures, which gives them the ability to discriminate human faces.